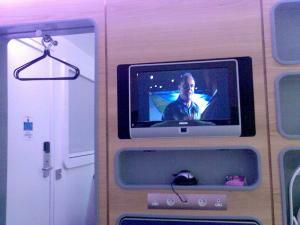 I stayed at the Yotel in Heathrow Terminal 4 the other day. I had an 11am flight to the US, and decided that instead of a 6am start from Cambridge, it made much more sense to stay literally 50m away from the British Airways checkin desk. This made me an accidental, but much appreciated, beneficiary of the T5 shambles - BA are keeping a lot of their long-haul flights in T4 until the new terminal has properly bedded down. I arrived at the Yotel's reception, aka "galley" at about 10pm. After a slight modification to my booking, I headed off to my "cabin" (there's a bit of a shipping theme), gained access with the ubiquitous card lock, and then headed straight for the shower. Two seconds later I realised that there was a window in my room, facing directly onto the corridor! I promptly closed the blind, but I really don't see the point of this window. Why would I want to be able to see onto the corridor - and vice versa? 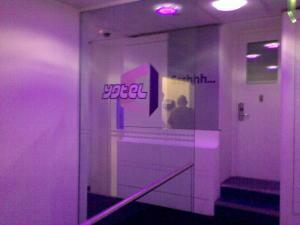 The Yotel concept is that you get a small room - about seven square metres - comprising an electrically folding bed (think business class seats) which is actually pretty comfy, a bathroom, a tv, and so forth. There's even a desk and chair, both of which fold away. Except the desk didn't. It got stuck half-way down. Fortunately it didn't obstruct the bed, but it did mean once the bed was extended, the only path from bathroom to door was to climb over the bed. Careful readers will be wondering where your baggage goes. 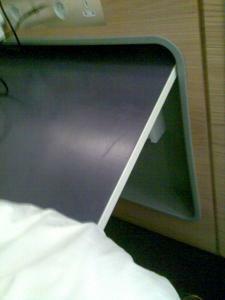 Yotel have thought of that - the bed is pretty high off the floor, and there's storage space underneath it. There's also somewhere to hang a suit up. The desk has power points and a network connection just above it, though I have to report that the network connection didn't work. For the technically minded, it assigned an IP address, but failed to pass any packets. Rather than try and fix Yotel's network for them, I just went outside (too much metal inside to get a signal) and made a phone call instead, over a pleasant pint at Weatherspoons. Apart from the desk and the network connection, I was pretty pleased with the room. There was some building work inside Heathrow that night, but earplugs (available from reception) completely blotted that out - and if you sleep in a standard airport hotel you just get to hear planes and traffic in any case. I slept well (almost too well, I missed my watch alarm, but had set up a backup wakeup call on the TV, which I recommend, because it turned the lights on as well), the shower was good, and it was a 1 minute walk to check-in in the morning. Does it have some issues? Yes. Would I stay again? Yes.